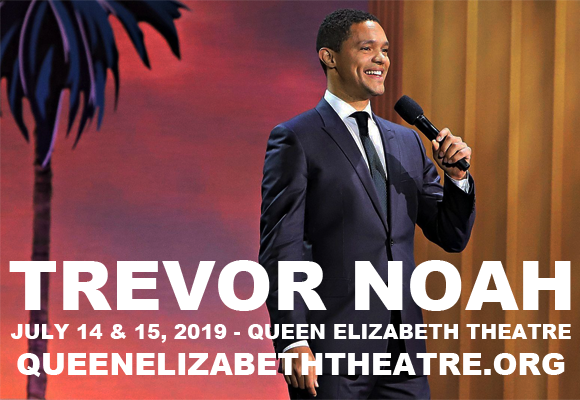 One of the world's biggest satirical comedians, Trevor Noah, comes to Queen Elizabeth Theatre on Saturday 15th June 2019 for the second night in a row! Loud & Clear is the best-selling author and Daily Show host's first arena tour, bringing you fresh, hilarious material from a man at the top of his game! Likeable, astute and energetic, not to mention riotously funny, Noah will have you captivated! Named by Time magazine in 2018 as one of the 100 most influential people in the world, Trevor Noah is a South African comedian, writer, producer, political commentator, actor, and television host. Noah began his career as a television host in South Africa in the early 2000s, serving as the host of the educational TV programme Run The Adventure from 2004–2006, whilst simultaneously becoming known on the comedy circuit as a stand-up comedian. His career progressed over the next few years as he became the host of several TV shows and in 2008 he came second place in the fourth season of Strictly Come Dancing. He was also the creator and host of Tonight with Trevor Noah on M-Net and DStv from 2010 – 2011. Noah left the show to move to the United States, and in 2012 he became the first South African stand-up comedian to appear on The Tonight Show, also becoming the first to appear on Late Show with David Letterman in 2013. He continued to appear on television both in the US and internationally, with appearances on more American talk shows, British panel shows and his own comedy specials. He began working on the Daily Show as their Senior International Correspondent in 2014, and the following year he succeeded long-time host Jon Stewart.